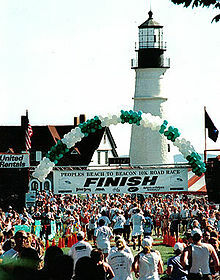 The race, which begins at Crescent Beach State Park and ends at the Portland Head Light in Fort Williams Park, covers a rolling, tree-lined course that Joanie trained on leading up to her historic 1984 Olympic Marathon win. After three days that locals called the best of the summer, meaning sunshine and low humidity, the weather moved in along the coast Thursday night delaying flights for many of the athletes who have come from 16 nations and 39 states. He and wife Sara, and Deena Kastor, didn’t land till after 11 pm in Boston, before getting a rental car and driving north, arriving in Cape Elizabeth at 2:30 a.m. The inference was to his ultimate 2013 goal at November’s New York City Marathon. After having to pull out of this spring’s Boston Marathon with an injury, Hall has retooled his training (again), going back to what had been one of his earliest success modes. With the Beach to Beacon field split between marathoners beginning their build up phase for the fall 26 milers, and road and track sharpees coming in fast and hot from either the road or track circuits, Hall knows the odds are stacked against him. His last race produced a 19th place 29:16 July 4th at Atlanta’s Peachtree 10K, which doubled as the U.S. Road 10K Championship. But with New York on the horizon, priorities must be maintained. Hall will lace up for the B2B against his long-time friendly rival Meb Keflizighi, who, unlike Ryan, arrives in Cape Elizabeth in racing form, fresh off a front-running third-place finish at last weekend’s Bix 7 in Davenport, Iowa. 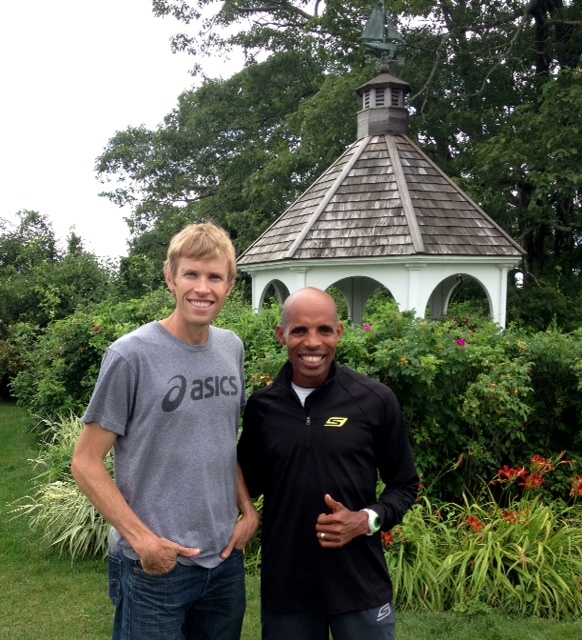 Meb, too, will be prepping for New York City come November. Unfortunately, a couple of top contenders for the prestigious B2B title have had to scratch due to visa problems, including defending champion Stanley Biwott and Ethiopia’s Tsegay Astedu. Almost missing the race, too, was last week’s Quad City Times Bix 7 women’s champion Sule Utura. After her win at the Bix the Ethiopian Federation was considering bringing her home as an alternate for the IAAF World Championship team heading to Moscow in another week. Utura is coming off a 10,000 meter track PR 30:55 in Europe, and a 14:59 5000 at the Paris Diamond League meeting. Fortunately for her, the federation pulled its request, allowing her to compete for the $6000 first-place prize in Cape Elizabeth. One woman who had something of the opposite problem, in that she wanted to go to Moscow, but was snubbed by her federation, is 2012 Kenyan Olympian Joyce Chepkirui. According to well-placed sources, Joyce is very fit, and was ready for the metal hunt in the 10,000 meters in Moscow. But the labyrinth that is politics in Kenya once again imposed another outcome. As such, among the very strong field of women contenders in Cape Elizabeth, perhaps none has more motivation than 24 year-old Chepkirui. Last year’s women’s winner and runner up, Margaret Wangari-Muriuki and Emily Chebet were both selected for the Kenyan Moscow team and will miss tomorrow’s B2B. However, 2009 World 10,000 meter champ and 2011 World Champs bronze medalist Linet Masai is here, along with 2010 B2B champion and course record holder Lineth Chepkurui. Lineth has recently won the Peachtree 10K and Utica Boilermaker 15K, making her a strong podium contender. Her course record of 30:59 from 2010 could be in jeopardy. The Kenyan trio will be tested by three Ethiopian neighbors, all with experience and speed. 2011 B2B champ Aheza Kiros, the first Ethiopian woman to win B2B, heads the list. She has speed on her side, having twice won the Carlsbad 5000 outside San Diego. Last week’s Bix 7 champion Sule Utura is joined by Bix runner up Buzunesh Deba, winner at May’s Lilac Bloomsday 12K in Spokane, Washington. American star Deena Kastor is anxious to test the course over which her predecessor Joan Samuelson first trained on her way to two Boston Marathon titles and an Olympic gold medal. 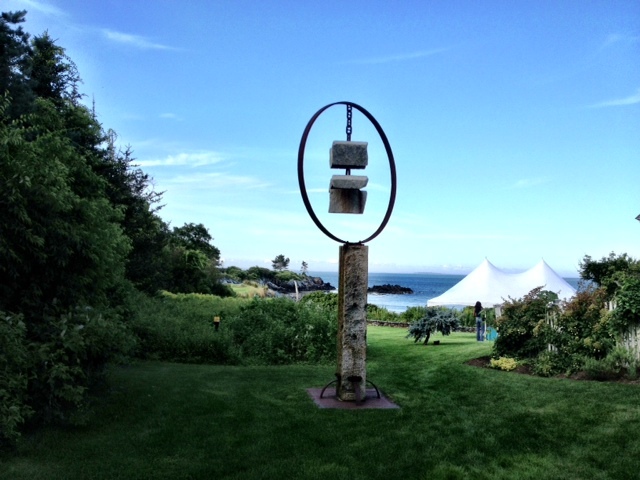 Joanie grew up in Cape Elizabeth just off Shore Road, which carries the runners from four miles to the Ft. Williams finish. Now many of the records Joanie set during her illustrious career have been erased by Deena. In 2011 Kastor came to B2B, but had to pull out of the competition when she got sick on race weekend. She is the lone competitor in Cape Elizabeth who will be flying to Moscow afterwards to compete in the World Championships. There, Deena will run the marathon. The men’s race is every bit as stacked at the women’s. 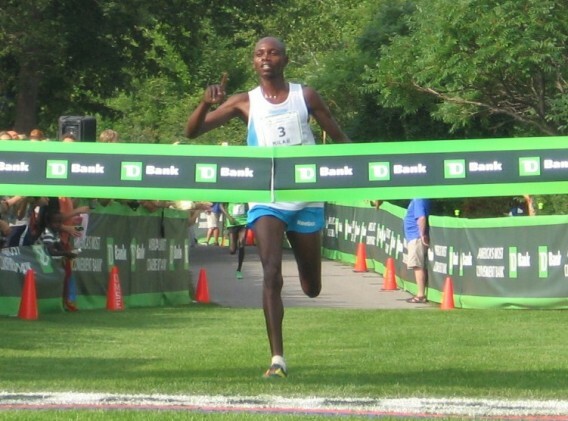 Though defender Stanley Biwott is out, 2011 B2B champion Micah Kogo of Kenya is back, coming off a second place finish in his marathon debut in Boston this spring. 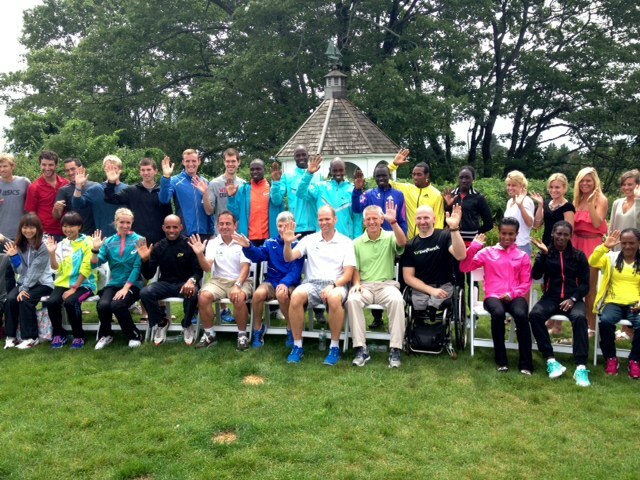 Kogo has experienced a lot of success in New England, winning the 2007 Falmouth Road Race on Cape Cod as well as the B2B in 2011. The bronze medalist at 10,000 meters at the 2008 Olympic 10,000, Micah (pronounced Mee-kuh) is also the former road 10K world record holder, running 27:01 in the Netherlands in 2009. Last year’s B2B runner up (by one second to Stanley Biwott) Stephen Kipkosgei-Kibet has returned. His last competition was a third-place finish at the ultra-fast and newly-designed Rock `n` Roll San Diego Half Marathon in June where he ran 61-flat. He claims to be at the same level of fitness as in 2012 when he ran 28:01 on the B2B course. Another first timer in Cape Elizabeth is 2011 London Marathon champion and course record holder Emmanuel Mutai of Kenya. This April Mutai was run down in the final kilometer in London by eventual champion Tsegay Kebede of Ethiopia. But Mutai held on for second in 2:06:33 after a sizzling early pace had the entire pro field struggling home in the final Ks. 2011 & 2012 Bix 7 champion Silas Kipruto of Kenya just missed out on a three-peat last week, finishing second by four seconds in a late race sprint. One final contender to mention is 20 year-old Kenyan Geoffrey Kipsang, another in the seemingly endless pipeline of champions hailing from the Great Rift Valley. Winner of February’s rocket-quick RAK Half-Marathon in the United Arab Emirates, young Kipsang’s 58:54 clocking was two seconds better than Stanley Biwott, which would have made their return match up here at the B2B so intriguing. In his last performance, the 2011 world junior cross country champion won the three H – hilly, hot, & humid — Bogata Half Marathon in July in 63:46. With Joan Samuelson leading the charge, TD Bank sponsoring the event for the 16th year – its president, Larry Wohl is one of the legacy runners at B2B, having run all 16 – and Boston Marathon race director Dave McGillivray and his DMSE crew handling the logistics, the TD Bank Beach to Beacon may not be the largest race (except in Maine), but it is held in special regard by those fortunate enough to have garnered one of its 6000 starter bibs. The race sold out in four minutes, joke McGillivray. Opportunity Alliance was selected as this year’s race beneficiary. Opportunity Alliance is comprised of 50 integrated community based and clinical programs serving more than 20,000 people annually. In 2011 three local programs were brought together under the Opportunity Alliance banner, integrating a system of early education and child care, nutrition programming, advocacy, mental health and substance abuse treatment, as well as basic needs for people living in poverty in Cumberland County. Over its 16 years the B2B has raised $750,000 in direct contributions to its beneficiaries. During Saturday’s race, which ends at the famous Portland Head Light overlooking Casco Bay, the 1086th finisher will become the 70,000th B2B finisher. Here’s to the next 70,000. As always Toni, great info, it’s a great read, but Micah Kogo run his 27.01 10k in Brunssum’s “Parelloop” Tilburg will maybe hold the future WR for women, as Turinesh Dibaba wants to attack Paula’s 30.21 of Puerto Rico ’03, on September the 1st! But first this race and than Moscow! Enjoy!